U336 Unique Rotary Milling Table Horizontal 6"
- The Table Body manufacturered from close grain shock resisting cast iron. 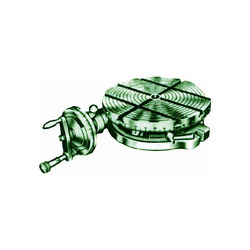 - Provided with quick precise disengagement of worm drive. - End play in wormshaft is adjustable. We are offering Milling Type Compound Slide Swivel Base to our client and our product is made of good quality. We offer Rotary Milling Table. - High accuracy, easy reading of all dias clear & functional arrangement of all operating elements, sturdy yet good looking practical design. We are actively engaged in manufacturing an extensive range of Rotary Milling Table With Indexing for catering the diversified requirements of our clients. - Worm drive disengagement is quick and precise. - An eccentric sleeve with thrust bearing races encases the worm shaft. End play in worm shaft is adjustable. Rotary Milling Table offered in quality metal construction finish and is made available at competitive prices. These full size milling tables come developed using high strength resin sand casting as well as feature 3-axis line rail and high speed spindle unit. - High accuracy, easy reading of all dias clear & functional arrangement of all operating elements, sturdy yet good looking practical design. 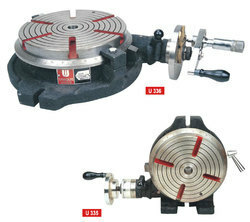 These are widely used for circular cutting, angle setting, boring and spot facing with a milling machine. Rotary milling table horizontal & vertical with indexing device. This is an accurate designed table for milling, boring and other machine tools. This table allows indexing, facing and other work to be carried out rapidly with extreme precision. We manufacture high performance tilting tables which have optimum utility. These tilting tables are manufactured from quality raw material and acknowledged for their durability and efficiency.